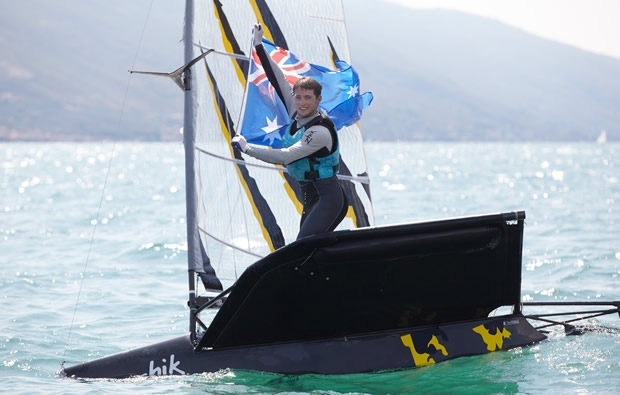 Scott Babbage capsizing at the first weather was enough of an indication of how demanding but equally spectacular conditions there were for the final day of racing at the Zhik Moth World Championship. The Pelèr, morning northerly breeze on Lake Garda, was blowing furiously from early on and with a violent storm forecast to hit Campione del Garda in the afternoon, the race committee had scheduled a 10am start. That gave the 60-strong Gold fleet of moths the opportunity to sail three exciting races that saw Josh McKnight prevail, practically from start to finish. When the race committee fired the gun for the day's first race, the 20-25 knot Pelèr and one metre waves were guaranteed to put a big strain on the sailors and their boats. Both Babbage and McKnight had a clean start in the middle of the line and headed to the right-hand side of the course, as close to the eastern shore of Lake Garda as possible. Babbage was in the lead at the first top mark with McKnight hot on his heels. That's when opportunity knocked on McKnight's door. A few hundred meters after the distance mark Babbage capsized and went for a swim. Then not only did McKnight assume control of the race, he stretched his lead and won with ease, ahead of Babbage and fellow Australian Rob Gough who would have his best day of the event. left. The move paid off and he rounded the first mark in third place, behind Mcknight and Babbage. He stuck to his strategy and overtook the leading pair while Babbage snatched second place from McKnight right on the finish line. Anthony Kotoun who struggled in these stronger conditions. same time I'm happy and relieved I did it. "It wasn't all easy today. Scott was ahead in the first mark but I had a two-point lead coming into the day so I knew I had to take a lot less risk than he did in order to win. I tried to sail safely and even if he did beat me in the second race on the finish line, I figured it was just one point. Scott and I train a lot in this type of conditions and he's the one that usually gets away and waits for me. So, for me to win in these conditions is really surprising." This concluded the 2012 Zhik Nautica Moth World Championships where there were record-setting participation both in terms of sailors (125) as well as countries (20). Conditions were on the lighter side in the beginning of the event, but then Lake Garda delivered and the Moths once again demonstrated their 'wow' factor. The Moths will now fly again in the 2013 World Championship that will take place in October on Kaneohe Bay, Hawaii.